Fobes Ranch Trail Junction (Mile 166.5) to Saddle Junction (179.4). Hi, Sean here. 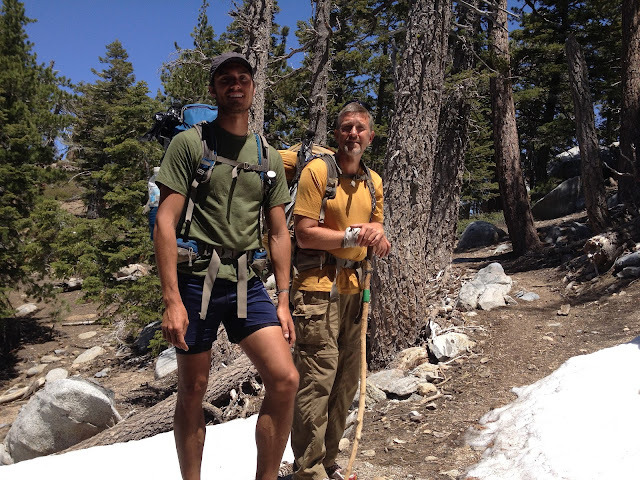 After hiking for some miles, we paused and Chuck and Chris were washing, scrubbing, with chill-chilly water from the mountain stream, and putting on less-dirty clothes, above the mountain town of Idyllwild. I was miserable and immobile a few feet away, wondering how the hell I was going to hike down the steep 2.5 miles of Devil's Slide Trail to where restaurants, hot showers, and beds awaited. Two days earlier I had popped a shin splint in the left leg ... I can remember the exact step when it happened. Now with each step it had gotten to a point where it felt like someone was doing a spinal tap on my tibia with a blunt letter opener (ultra mixed metaphor, I know). According to stuff I had read, a shin splint can take something like 2-3 weeks to mend but needing rest & recuperation. Long distance hikers, however, as a rule hike on through the pain -- and they get over shin splints (as long as it isn't a really severe case). But while painful this shouldn't do more damage. The odd thing is that my leg hurts more going down a slope than up -- a most unjust circumstance in the cosmology of long-distance backpacking. She took us to the Apple Blossom Inn, a lovely gay-owned rooms-with-kitchenettes place less than a block from downtown. After cleaning up and shaving our necks, the guys walked (I Walter-Brennaned) out to the Mexican restaurant called Arrecita's and drank Margaritas made with agave wine, and hate heartily, to celebrate Cinco de Mayo. Chris and Sean in the snow fields above Idyllwild.